Calculate Worksheet Method in VBA is used to calculate all open workbooks or a specific worksheet in a workbook or a specified range in a worksheet. Why we use Calculate Worksheet Method? Why we use Calculate Worksheet Method in VBA? If a workbook or a worksheet or a specific range has formulas we need to refresh each time when the values are changing. In that time we can use Calculate Worksheet Method in VBA. Here is the example syntax to Calculate Worksheet method in Excel VBA. 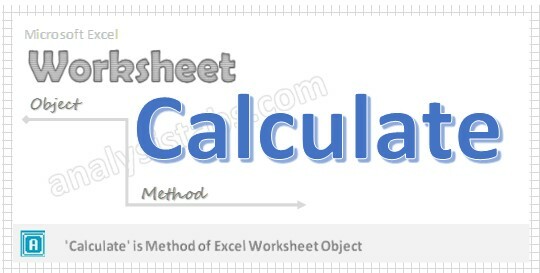 Where Worksheet represents the object and Calculate is the method of worksheet object. Please see the below VBA code to Calculate all open Workbooks. In this example we are using calculate method of application object. Please see the below VBA code to Calculate in specified Worksheet named “Sheet1”. Please see the below VBA code to Calculate in specified range (“A1:E10”) in a specified worksheet named “Sheet1”. Press ‘F5’ to run it or Keep Pressing ‘F8’ to debug the code line by line and observe the calculations in the Worksheet.